Zinc is toxic to parrots and may lead to acute and chronic poisoning. These may result in severe organ damage and often death. Unfortunately, it is difficult to diagnose chronic zinc poisoning, as the symptoms are not specific. This results in high mortality for chronic zinc poisoning. Therefore, it is of the utmost importance to ban any items containing zinc, such as cages, aviaries, cups, toys, etc. from your parrots’ surroundings. This is easier said than done, as it is really difficult for a laymen to distinguish zinc from other materials. With some practice you may tell the difference between stainless steel, nickle, chrome and zinc plated materials visually. As colour differences are possible, you are still safest, though, to test it. Of course, you may send metal parts to a laboratory for testing. The lab will determine the exact amount of zink. But the part will be completely destroyed – even if it was not zinc – and also these tests are awfully expensive. Thus, it isn’t really feasible to test all your parrot supplies. The magnet test only helps to determine whether the metal you are testing is a high quality stainless steel alloy. These kinds of steel do not react to a magnet. As lower stainless steel grades, as well as any nickel or chrome plated steels will be drawn to a a magnet, this test has only limited usefulness. A qualitative test for zinc may be performed with hydrochloric acid. The intensity of the reaction is determined by the concentration of the acid. For the photos I used so called technical hydrochloric acid which is available in concentrations between 33 – 35%. Hydrochloric acid is a corrosive substance which smells strongly. You need to vent your work area well. The easiest would be to do the test on your balcony or patio or at the least in front of an open window. Do not do it anywhere near your birds! The fumes are like strong vinegar. Not something you really want to inhale. Also you need to wear protective clothing that can easily be removed, such as an old large shirt or – if you have – a lab coat. If you spill any acid, remove the protective clothing quickly, before it can soak through, and you’ll be fine. You should wear rubber gloves and goggles to protect your eyes should you splash. Also keep a bowl of fresh water on hand, to rinse away splashes and to place your tested articles in to wash away the acid residue. Attention! The hydrochloric acid test should not be done by children! Place the metal parts you want to test on a clean porcelain plate which will not be affected by the hydrochloric acid. Then you put a drop of the acid on the metal – an eyedropper works very well for this and I actually keep a little glas eyedropper bottle with hydrochloric acid on hand for quick testing. Important! Metal parts are often covered with a thin transparent lacquer layer to reduce wear and tear. You must remove this before testing so that the acid will actually be able to contact the metal. Otherwise you will get a false negative for the test, as the acid will not able to react with the protected metal. Thus, remember to scrape off the lacquer layer with a small knife prior to testing. Zinc: strong, foaming reaction with the hydrochloric acid. The metal turns black. Stainless steel: no reaction. The liquid may take on a slight greenish tinge. Nickel: Very weak or no reaction. The liquid may take on a slight greenish tinge. Chrom: Very weak or no reaction. The liquid may take on a slight greenish tinge. 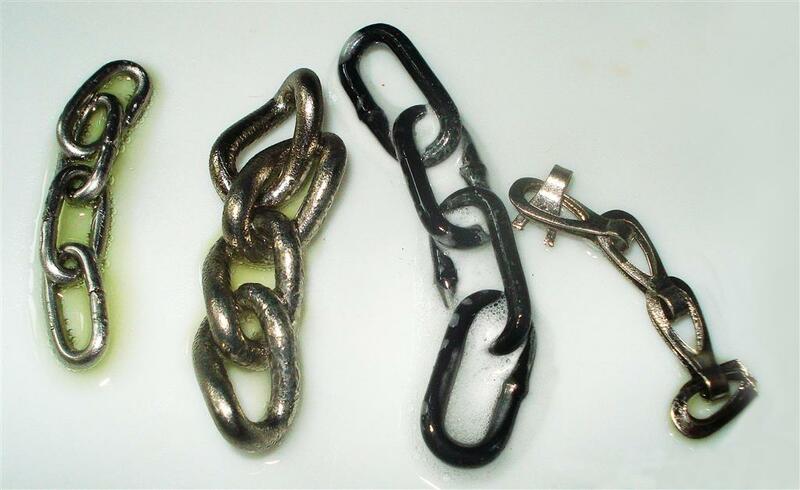 To get some experience with the test, go to a DIY store and purchase little bits of chain with the different metal types, as I did for these photos. You will see the clear differences in the test reaction when you compare them. If your metal showed to be zinc free in the test, you may return it to your parrots after thorough rinsing to remove all acid residues.